Where real estate professionals hangout and share ideas. In this episode, Greg shares how he nurtures and delivers value to his database – from prospecting, getting email addresses, staying in touch, tagging/segmenting prospects, and marketing to them – it’s important to put in the work NOW to build a foundation for the FUTURE! In this episode, Greg Harrelson shares how to set yourself up for success in 2019! It’s important now, more than ever, to have a plan when the market shifts due to economic, technology, or business model changes. Through persistence and consistent follow-up, learn how you can prepare yourself and take advantage of the changing real estate market in the upcoming year! We'd like to thank Myrtle Beach, SC, real estate broker, Greg Harrelson, for joining us on this hangout. Keeping It Real On Location is presented and hosted by our very own Jeff Manson, Hawaiian real estate broker of American Dream Realty and founder of Real Geeks. In this episode, Jose shares how he went from 9 sales per year to 110 sales per year. He also shares how he’s able to focus on the right people at the right time to convert more business from his COI and all his lead sources! 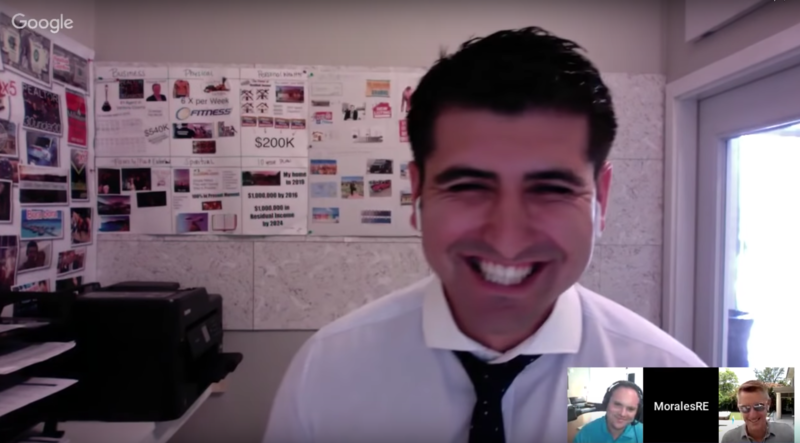 We'd like to thank Ventura County, CA, real estate agent, Jose Luiz Morales, for joining us on this hangout and sharing how he is crushing it! Join us for the next Keeping It Real, with Eric Robb of Atlanta, GA, and see how “Eric Sold 45 Homes in his First Year”. Having sold 45 homes in his first year as a single agent, with a volume of $14MM in production, Eric will share the different lead sources and processes he is using to build more business from his database and online leads. Eric will also share how he decided to become a single agent after being part of a large successful team. Join us for the live, 100% educational Keeping it Real event with myself and my co-host Frank Klesitz with Vyral Marketing. It will be a great show. In this episode, a group of top producing real estate agents travel to our headquarters in Dallas, TX to discuss how they’re leveraging the Real Geeks platform to generate more business. Todd Tramonte, Brett Baker, and Jason Simard, 3 top-producing agents, talk about how they use systems and technology to build successful real estate teams. They dive deep into different marketing techniques to drive traffic to different landing pages like Facebook, PPC, and other traditional marketing strategies. They also share the different systems and technologies they use to do better follow-up, convert more leads into sales, and get the great ROI from every channel. They answer many questions live, you don’t want to miss this! Seven top-producing agents meet up at the Real Geeks Dallas headquarters for a roundtable mastermind event to share what’s worked best for them in 2017 to generate more business. They discuss lead generation, lead follow-up, how to build a team, how to convert buyer leads into listings, systems and software, and much more! You don’t want to miss this! We travel to Myrtle Beach, SC and catch Greg Harrelson coaching his team as they set appointments and take listings over the phone LIVE! Greg dives deep into how he trains his agents to do 80+ transactions in just one to three years in the business. Learn the process and systems that Greg and his team implement to close 2,400 transactions in 2017! 00:10:53 "I feel like I'm a team"
00:11:45 What does a team do? 00:19:10 What tools do you use? 02:22:05 Role-play "When do you plan on selling?" 02:26:02 Role-play "How to set a listing appointment"
Todd will earn over $1,000,000 in gross commissions earned in 2017. Todd will share his 3 main lead sources and how he's getting 1,958% ROI from internet leads. Todd's team consists of four full-time agents making over $100,000 a year! He will share the systems they use as well as the processes they follow to get such a high ROI and conversion rate. Join us for the live, 100% educational Keeping it Real event with myself and my co-host Frank Klesitz with Vyral Marketing. It will be a great show! Join us on the next Keeping it Real "8 to 250 Deals in 2-years" with Lisa Chinatti of Westford, MA. We dive deep into Lisa’s journey to find out how she will close 250 deals this year! In 2015, Lisa was a part-time agent, full-time mother and sold 8 homes. The following year, in 2016, she hired an assistant and got serious with her business and sold 82 homes, and $700k in GCI. As of today, she has over 150 homes with approximately $1.3M in GCI closed and pending. She is well on her way to hitting her goal of selling $2M in GCI by the end of the year. She will share all the ways she’s generating business from follow-up, to team structure, and much more! Join us for the live, 100% educational Keeping it Real event with myself and my co-host Frank Klesitz with Vyral Marketing. It will be a great show. Join us on the next Newer agent, Abe Safa, will share how he will sell 75 properties in his 2nd year in the business. 85% of his sales this year will be listings taken and sold! Here are a few things we will cover: • How he is leveraging his database to generate more listings • How he effectively follows up and converts more leads into deals • How he simplified things to stay focused and sell more homes • Daily routines, systems, and procedures he uses to achieve his goals • The training he follows that has allowed him to be so successful! Join us for the live, 100% educational Keeping it Real event with myself and my co-host Frank Klesitz with Vyral Marketing. It will be a great show. Join us on the next Keeping it Real “Working 20 Hours a Week Selling 200 Homes a Year” with Barry Jenkins of Virginia Beach. In 2016, Barry sold 132 homes with 32 million in volume, see how he is on track to do 200 transactions this year by leveraging systems and technology to generate leads. See how he is able to work less hours while producing a high level of sales. He will also share how he’s streamlined his follow up and escrow coordination processes for him and his team. This episode of Keeping It Real: “How Kory Tripled His Real Estate Business in 1 Year”. In one year, Kory has grown his commission income from $72,000 to $232,000. Watch this LIVE hangout to learn how Kory converts 4-5% of his leads into sales by CONSISTENTLY applying his follow-up strategies, and how he has generated an additional $90,000 in referral revenue. - How he makes the most efficient use of time he spends prospecting? - His PPC strategy to get the most ROI ?- How he keeps his database engaged? - How he built his site authority to bring in 30-50 organic leads per month? - His highest converting email drip campaigns ? - The call scripts that help him turn 5% of his internet leads into closings?- How he prioritizes follow-up for his incoming and hot leads to maximize his appointments and deals? ….and SO MUCH MORE. You absolutely have to watch this if you want to exponentially grow your business in 2017! To get more information on the tool that Kory uses to streamline his communication with incoming leads and maintain his referral revenue, check out our video on how to use the Real Geeks CRM in your business. We'd like to thank Port Coquitlam, BC real estate agent, Kory Prince for joining us on this hangout and sharing how he is crushing it working internet leads! Join us on the next Keeping it Real “How to Dominate Facebook Marketing”. In the first 37 days of 2017, Don Mertes and his team have taken 12 listings and 21 escrows from Facebook Marketing alone! Join us on the next Keeping it Real “How Jason Sold 135 Homes in his 1st Year”. Having sold 135 properties in his first year in the business, Jason Simard is going to share the 12 principles you MUST do to succeed at this level! See how he takes massive action in his business and is able to stay focused on a handful of simple things and not get paralyzed by over-analyzing and over-complicating things. Jacky, one of his business partners, will be joining us on this hangout, to share his insights as well. Be ready to take notes and learn a lot as we dive into how Jason runs his business! We catch Josh and his team setting appointments live! He gives us a tour of his office and introduces us to his marketing and administrative team. Learn how they are going to close 450 sales this year and manage 70 to 100 listings at any given time… by providing amazing service to their clients. Jeff Quintin shares how he is getting huge results from working expired listings and COI (center of influence)! With 100 closed and pending sales so far this year, and a goal of 200 for 2016, watch how he and his team set appointments live in this episode. We hang out with Jeff and his team for three days as he shares everything he does to generate business and how his team is structured. …and so much more! This is a MUST see!! 28:34 Jeff explains the difference between income generating side and income serving sides of his business. Tri-Cities real estate agent Brett Baker is going to share how he is getting huge results from his Facebook Marketing. One $68 FB ad resulted in 4 listings taken & 4 buyers under contract. Be ready to take notes and learn a lot. Brand new real estate agent Jason Simard shares how he is going to sell 90 properties his first year in the business. He will also share how he has put 26 deals together his first 90 days in the business. He will also share how he is leveraging Facebook with videos to generate listings. Have your pencil and paper ready to take notes.